The Eurozone economic data could not support EUR against USD. USD is also getting some strength due to US Treasury bond yields and last week’s Sino-U.S. talks. The support rests at 1.13650 with resistance at 1.14090 which both lines are below the weekly pivot point at 1.14790. The EMA of 10 is moving with bearish bias in the descendant channel and it is below the EMA 100 and the EMA of 200. The RSI is moving below the 50 level and the Stochastic is moving in low ranges. The MACD line is below the signal line in the negative territory. The ADX is showing sell signal. 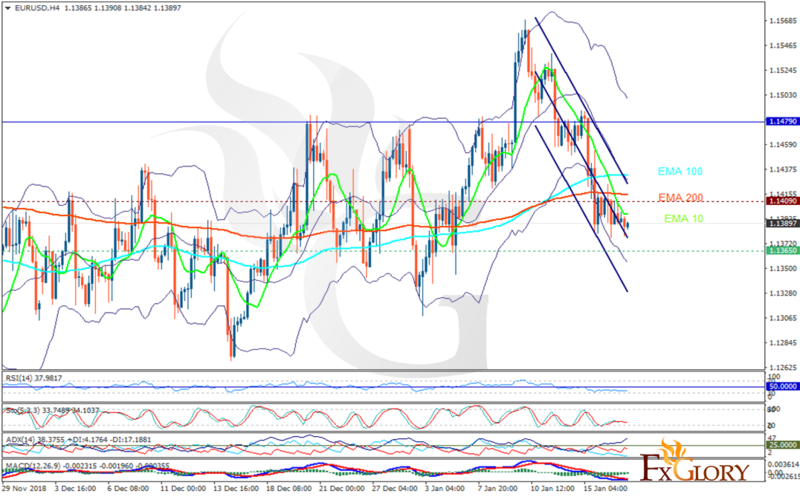 EURUSD may decline towards the lower Bollinger band at 1.1355.